360 degree rotating washable mop. No spills, no shock and no damage to floors. Microfiber mop head works great wet or dry. Keeps user hand totally clean, no extra power consumption. Super labor-saving industrial floor mops. Manual press system spin mop. Mop head is machine washable. Smart and colorful bucket High-speed rotating washing by pressing the mop rod. Putting the microfiber mop heads into the dehydrate basket. Pressing the mop rod to make the mop head rotate and being dry. Navisha Easy Magic 360 Degree Spin Floor Bucket PVC Mop with 2 Microfiber Heads & Free Tile Brush, Gloves is a premium quality Wet Mops from Navisha. Moglix is a well-known ecommerce platform for qualitative range of Wet Mops. All Navisha Easy Magic 360 Degree Spin Floor Bucket PVC Mop with 2 Microfiber Heads & Free Tile Brush, Gloves are manufactured by using quality assured material and advanced techniques, which make them up to the standard in this highly challenging field. The materials utilized to manufacture Navisha Easy Magic 360 Degree Spin Floor Bucket PVC Mop with 2 Microfiber Heads & Free Tile Brush, Gloves, are sourced from the most reliable and official Wet Mops vendors, chosen after performing detailed market surveys. Thus, Navisha products are widely acknowledged in the market for their high quality. 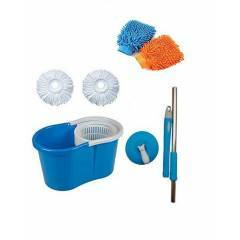 We are dedicatedly involved in providing an excellent quality array of Navisha Wet Mops.